In June 2016 the School undertook its second annual parent survey. We used the same survey questions as 2015 to enable us to track the progress the School is making. The aim of the survey is to collect the thoughts and feelings from parents and carers to form part of the new School Improvement Plan. We had a response rate of 51%. Thank you to all our parents and carers who participated. We value your feedback. 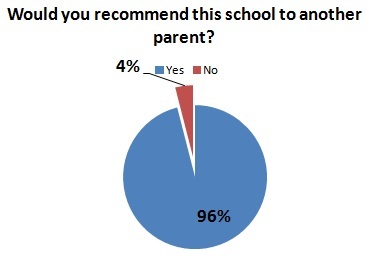 We are delighted that 96% of respondents would recommend our school to other parents. The survey responses confirm areas where the work we are doing in school is being communicated well and is well recieved by the parents and carers. The responses also help us identify areas where we need to focus going forward. The last two questions of the survey gave parents the opportunity to tell the Local Board and the Senior Leadership Team what they thought the School did well and what could be improved. We were pleased to see the areas that had been identified for improvement last year did not appear again this year. Indeed, some of the things identified as ‘could do better’ in last year’s survey, were noted by parents as what the school does well. In particular, parents liked the weekly celebration assembly, improved communication and good community engagement.